One Punch Man Episode 8. 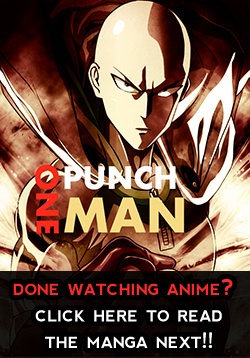 Watch One Punch Man Episode 8 in High Quality HD online on www.OnePunchMan.tv. You Are watching One Punch Man Episode 8. Episode 8 in the TV Anime Series One Punch Man. aaah too ling 5 days ugh!! 2 DAYS MORE YOU CAN DO THIS!! does anyone know how many episodes opm will have?i looked up wikipedia and it says 12+6 ovas.if thats true then there is only 5 episodes left.anyone with any ideas? 11.5h left lets go time warp! Hell Yeah! All bow before our lord and savior, the Handsome Pri-Pri Prisoner! We are all but his sweeties in his eyes! It’s a 2 parter, and this is the half that sets it up, there were no real fights in it, the whole point of this episode is to show strong-ish characters fighting the enemy and being beaten to establish how powerful the character is. SAITAMA IS GONNA MAKE A FISH FILLET NEXT EPISODE! This was dissapointing, although maybe it was nessasary too, We all know that Saitama is gonna show up as Genos is almost kicked unconscious, and kill the sea king in one punch. Well, even the manga had two chaptersand it isn’t surprising that the episodes are also divides into two….you haven’t seen his first ‘serious’ punch yet…. Firsst time when i need to wait 2 episodes for Saitama’s fight ..
zzzz.. All I was so frigging excited on what will genos do.. and yet… why do you do this to us? You’re right. Didn’t slept last night, and its hard just to stop! Dammit! What??? Dayum! This episode is killing me! We’ll be waiting several days again for the next episode! This show is getting better and better! Damn I forgot how long this arc was. where is the one punchhhhh? My face fell the second the outro started. Holy mother of fish puddings… Saitama at the ending made me have goosebumps with his badass serious expression! Even though I re-read the manga so many times and know what will happen, this anime still excites me! These episodes are as short as Saitamas hair..
It’s only going to be 12 episodes.